Is Great Customer Service Contagious? In my last post, I asked whether people prefer to contact customer service by phone or email. People shared some great stories and advice in the comments. I want to especially thank Doc Kane – I tried his strategy (see Doc’s comment to my last post) the very next day with UPS and it works!!! Big thanks to everyone who joined that conversation. Your feedback was awesome and taught us a great deal! Lately, I’ve been thinking about how crowdSPRING can promote great customer service across our entire community. We recognize that as a company, we must provide great customer service. But we are also seeing some outstanding examples of customer service directly in our community. Is great customer service contagious? Can an online community share the values of great customer service? Our recent experience suggests that the answer to both questions is YES. Last week we experienced a very heavy load on our database server early in the morning (due to heavy traffic). The site crashed by 8:30 a.m. CST. While the site was down, it was impossible for our community to contact us via the site. This is where things got interesting. Even though people could not access the site, they found creative ways to contact us. They found our email addresses and reached out directly to us to let us know the site crashed. This happened within minutes – before we realized we had a problem. Here’s what we thought was most amazing about those emails – people were worried about access to the site by the whole community – not just their own ongoing projects. Our team promptly reacted and fixed the problem within 20 minutes. Because our normal systems were not working during that brief outage, we had to find creative ways to help customers. For example, Chris, one of our talented developers, brilliantly handled direct emails from users and reassured them that the site would be back up quickly. During that brief period of time, our team and our community were one – together finding ways to fix the problem which caused the outage and keep users informed. This was truly amazing! We continue to be amazed by the fact that this was not an isolated example. We see collaboration in our marketplace, in our forums, and in our blog. We see creatives helping each other in the forums. We see the entire community collaborating to improve both our marketplace and our rules and procedures. Many in the community are helping us to drive essential changes that will improve the user experience for everyone. It’s a competitive environment for sure – but the level of collaboration is fun to watch. So what does it take to make good customer service contagious? 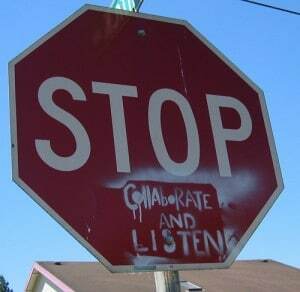 What do you do to empower your team and your community to collaborate?